Recently, the air we breath has become a topic of contention. Air pollution has brought thick miasmas to cities across the UK, and the EU Commission has gone so far as to launch legal proceedings against the UK for failing to deal with the problem. With pedestrians and cyclists baring the brunt of the situation, it can be easy for drivers to sit comfortably behind the wheel and not give a thought to the air they too are breathing in, but that air may not be as clean as expected. A range of air pollutants enter the cabin, including dust, dirt, pollen and exhaust fumes. 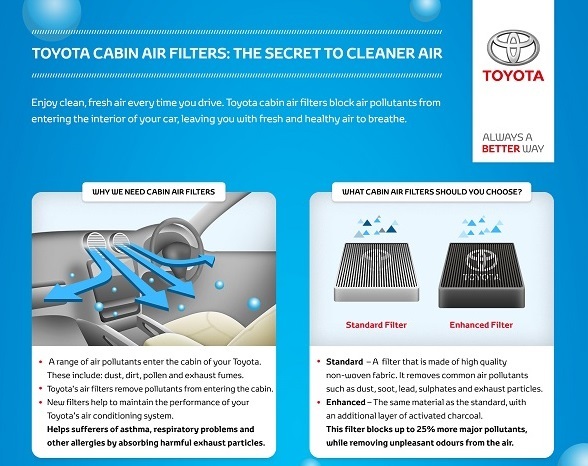 Toyota offers a cabin air filter to maintain fresh air circulation on your car. Available in ‘Standard’ and ‘Enhanced’ variants, the filter is made of high quality, non-woven fabric that captures unwanted materials, and prevents them from entering the cabin. With an additional layer of activated charcoal, the Enhanced filter removes up to 25 percent more pollutants, and neutralises unpleasant odors. It’s important to replace the cabin air filter regularly.Your cabin air filter should be inspected every 10,000 miles, to ensure that the performance of your car’s air conditioning remains optimal. Your driving environment can increase the frequency of air filter replacements; for instance if you predominately drive in congested a congested city, the life-cycle of your cabin air filter may be reduced. 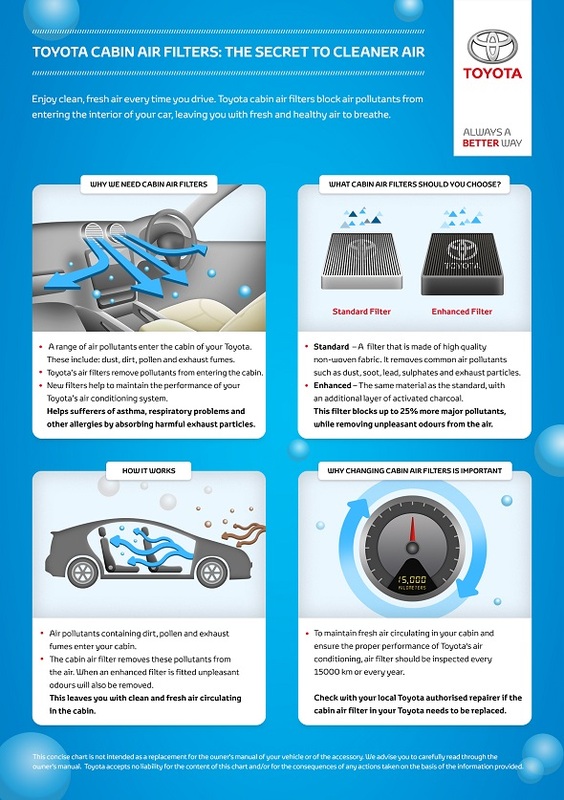 Your Toyota dealer will be able to advise you on the filter’s condition at service time. Don’t forget to maintain the additional filters in your Toyota too – carbon and engine air. The replacement times for these parts vary model to model. Taking Prius as a guide, the car’s carbon filter requires replacing at 10,000 miles, while its engine air filter should be checked at 20,000 miles, and replaced at 40,000. You can find out more about air filters, and other Toyota parts on the designated section of the Toyota UK website, alternatively, visit your local Toyota dealer. Thanks for providing your registration. We can confirm that there is no cabin filter for your vehicle. Do you have cabin filter in 2007 aygo model. I have done service but I could not find the place to change the cabin filter. I don’t have air condition in my car. It is just blow Norma air or do good heating. Can you explain or send me a manual how to change it.